Best Tracks: Rhinestone Eyes; On Melancholy Hill; To Binge. It was difficult to see where Gorillaz could go next after 2005’s brilliant Demon Days. Damon Albarn’s projects with The Good, The Bad and The Queen, and the Blur live shows suggested that they may even have been shelved for good. When I heard about Plastic Beach, therefore, I was delighted at the prospect of new Gorillaz material, but slightly apprehensive. My concerns were heightened by some less that complimentary pre-reviews, accusing Albarn of using Gorillaz as a platform on which to voice his political and environmental opinions. I can’t help but wonder if the aforementioned reviewers actually took the time to listen to the album, or merely glanced at its title and formulated an ill-informed opinion from there. Yes, it’s called ‘Plastic Beach’, and yes, there are occasional mentions of fast food, landfills, and plastics, but any kind of ‘message’, if it exists at all, is so deeply buried, that it barely even registers. Any images I got, with assistance from the front cover and additional sleeve artwork, were of a distant island, in the middle of a vast ocean, on which these dysfunctional, bizarre characters Gorillaz live. This album truly is a masterpiece, and probably the finest work Albarn has produced to date. In this setting, even the bleeps of ’80s Casio keyboards sound magical, a feat not to be taken lightly (I had one myself, and succeeded in producing only distorted, whining retches from it). The beats alternate between breezy (Melancholy Hill) and gloriously chaotic (Glitter Freeze), instrumentation ranges from lush orchestration (Orchestral Intro) to sparse keyboards and guitars (Empire Ants), and the fusion of genres is such that pigeon-holing this album would be an impossible task. The only let-downs on Plastic Beach both come from collaborators. On Superfast Jellyfish the adolescent rapping style from De La Soul combined with the repetition of their sub-standard lyrics spoils the track somewhat, whilst on Some Kind of Nature Lou Reed seems to have gone into the vocal booth and recorded the whole song in one take, making up the lyrics and melody as he went. It is worth noting, however, that on both tracks, Albarn provides excellent choruses and/or bridge sections, which salvage them from being completely hopeless. When I wasn’t listening to this album, I wanted to be, and every time I came away from it, I did so humming a different tune. 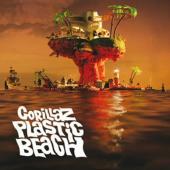 It’s Plastic Beach’s strength in depth that makes it such an enthralling listen, and each track provides something interesting and new. This is an absolute must for any music fan.